ASHEVILLE NC – The Cradle of Forestry invites people of all ages to celebrate the heritage of western North Carolina during the annual Forest Festival Day on Saturday, Oct. 5 from 9:00 a.m.-5:00 p.m. This is the Cradle’s largest event of the year. This activity-filled, family event commemorates the traditions of mountain living and craft in a unique and beautiful setting. More than 80 traditional craftsmen, exhibitors and forestry students will be on site during the celebration. During the event, five colleges will compete for a trophy in the 18th Annual John G. Palmer Intercollegiate Woodsmen’s Meet, organized by Haywood Community College. STIHL is the presenting sponsor of the festival. Festival-goers can cheer as college forestry students compete during the Woodsmen’s Meet that has the flavor of an old-time lumberjack competition. Students from Haywood Community College, Warren Wilson College, Penn State Mont Alto, Montgomery Community College, and North Carolina State University will test their skills in a number of events including archery, axe throwing, crosscut sawing and pole felling. Spectators of the Woodsmen’s Meet are encouraged to bring a chair or blanket to sit on. Among the Cradle of Forestry’s historic buildings and trails, visitors can see demonstrations of spinning, candle making, pottery, whittling, wood carving, a spring pole lathe and creating corn husk dolls. Visit with Trout Unlimited volunteers and try casting for one of the trout in the pond. Try archery under the guidance of the North Carolina Bowhunters Association. Learn about efforts to restore the native chestnut tree from The American Chestnut Foundation. New this year will be two falconry demonstrations at the amphitheater. Meet live birds of prey and learn about their special hunting adaptations. Festival-goers can ride a horse-drawn wagon along a section of the Forest Festival Trail. Accents on Asheville will provide a shuttle to the Woodmen’s Meet for those unable to walk the trail to the event. Hob Nob at the Cradle will sell food. Forest heritage is a focal point of the festival, and the Cradle of Forestry is the birthplace of modern forestry in America. Dr. Carl Alwin Schenck, forester for George Vanderbilt’s Biltmore Estate from 1895 – 1909, founded America’s first forestry school in 1898 and used the present Cradle of Forestry area as its summer campus. At that time the word “forestry” was a vague and new idea in this nation. He encouraged his students and timberland owners to manage forests for the future. Forest Festival Day celebrates this heritage and our forest lands today. For a complete list of activities, exhibitors and demonstrations during Forest Festival Day visit www.cradleofforestry.com, or call the Cradle at (828) 877-3130. Admission for this event is $6.00 for ages 16 and older; $3.00 for youth ages 4-15, and holders of America the Beautiful and Golden Age passes. Children under 4 years old are admitted free. The Cradle of Forestry is located four miles south of Parkway Milepost 412 on Hwy. 276 in the Pisgah National Forest, six miles north of Looking Glass Falls. ASHEVILLE NC – Buncombe County is bringing flu vaccine to the community by partnering with Maxim Healthcare, Buncombe County Schools and Asheville City Schools to offer Community Flu Vaccine Clinics at seven schools throughout the County from September 30 through October 9. WHAT: Flu vaccines in two different forms (as a shot and a nasal spray) will be offered at the Community Flu Vaccine Clinics at nearby schools. WHO: Anyone 6 months and older. WHY: To assure that families of school age children have easy access to flu vaccine at no cost to children and pregnant women without health insurance, as well as adults who are eligible. Increasing the number of children who are vaccinated against the flu helps reduce flu in our community. For more information, call the FLU VACCINE HOTLINE at 250-6400, or call Gaylen Ehrlichman at 250-5045. Media requests call 775-1321. Fall is Here – What Does the Farmer’s Almanac Say? 16th-19th. Thunderstorms along Gulf Coast. Rain for Tennessee east, then fair. 20th-23rd. Hot and oppressively humid. 24th-27th. Fair, turning much cooler for Mississippi Valley east. 28th-30th. Widespread showers for most of the Southeast. 1st-3rd. Fair and cold; frosts invade parts of the Southeast. 4th-7th. Wet Tennessee Valley. Heavy rains Gulf States. 8th-11th. More frosty weather as it turns fair and colder. 12th-15th. Showery, then fair and blustery. 16th-19th. Pleasant early fall weather. 20th-23rd. Rain moves in, then quickly clears, becoming fair and cold. 24th-27th. Showers, turning fair and chilly. 28th-31st. Unseasonably chilly weather arrives for Halloween. ASHEVILLE NC – WNC Regional Air Quality Agency (WNCRAQA), the Biltmore Iron and Metal Company, and the Buncombe County Solid Waste Department will host a FREE gas can exchange program at the Western NC Air Quality Agency at 49 Mt. Carmel Road in Asheville. The exchange will be on Friday, September 27 from 8 a.m. – 3 p.m., while supplies last. Bring your old, EMPTY gas cans (that are not equipped with new spill and vent-proof features) to t he event and exchange each one for a new, environmentally friendly, Briggs and Stratton gas can. The new cans are available in 2-gallon and 5-gallon sizes, and there’s a limit of 5 new cans per person. 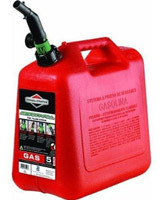 We cannot accept gas cans that contain gasoline or other fuels. If there is ANY fuel in the can, it will NOT be eligible for the exchange. This purpose of this project is to reduce air pollution emissions. The WNC Regional Air Quality Agency has entered into an agreement with a corporate donor to receive and exchange the lower emitting gas cans for the benefit of the citizens in our area. Any product defects or issues should be addressed with the product manufacturer. Why a Gas Can Exchange? Gas cans and the way we use them can harm Western North Carolina’s air quality and our health. Gas contains many harmful pollutants called volatile organic compounds (VOCs). Spilled gas and gas vapors do not disappear; they end up in the water, in the soil, and in the air. VOC emissions from gas cans occur from evaporation and spillage from overfilling fuel tanks. Emissions are also released through secondary vent holes and permeation through the container walls when transporting and storing the cans. Storing conventional gas cans may pose a threat to the health of those in the home. When older, conventional gas cans are stored in the basement or the garage, the toxic vapors emitted can harm those with respiratory ailments. In addition, VOCs can react with nitrogen oxides (NOx) from vehicles, industrial facilities, and other combustion sources to form ground-level ozone. Too much ground-level ozone can be harmful to our health and the environment. Trading in an older, leaky gas can for a new, environmentally friendly can might not sound like a big deal on its own, but when you add up the impact of all of these trade-ins, the emissions reduction does make a difference. According to the US EPA, older, traditional gas cans release about 8 pounds of VOCs through spills and evaporation each year. By using newer gas cans, which are made of materials that minimize permeation losses and include features such as spill-proof shut off valves and no secondary vent holes, harmful gasoline vapors can be reduced by at least 50 percent, or 4 pounds per can per year. With this gas can exchange program, we can reduce VOCs in Buncombe County by 3,384 pounds every year. For more information, visit www.wncairquality.org or call WNCRAQA at 250-6777. ASHEVILLE NC – The Orchid Ensemble, which blends modern and traditional Asian music with influences from all over the globe, will perform at 7 p.m. on Thursday, October 10 in UNC Asheville’s Lipinsky Auditorium. Using ancient Chinese instruments and Western percussion, the Vancouver-based Orchid Ensemble embraces a variety of musical styles, ranging from the traditional and contemporary music of China to world music, new music, jazz and creative improvisation. Ensemble members Lan Tung on Chinese violin, Haiqiong Deng on Chinese zither, and Canadian percussionist Jonathan Bernard create new sounds that defy easy categorization. The Orchid Ensemble tours across North American and has performed at The John F. Kennedy Center for the Performing Arts and the Smithsonian Institution’s Freer Gallery. Tickets are $20; $12 for UNC Asheville faculty, staff and alumni; $7 for Asheville-area students; $5 for UNC Asheville students, and are available at uncatickets.com or at the Highsmith Student Union front desk. The concert is sponsored by UNC Asheville’s Cultural Events and Special Academic Programs office. For more information, visit the Cultural Events website or call 828.251.6674. ASHEVILLE NC – The Friends of the WNC Nature Center are pleased to host the 37th annual Hey Day fall festival at the WNC Nature Center, Asheville‘s Wildlife Park, from 10 a.m. to 4 p.m. on Saturday, October 12. The tradition continues as the City of Asheville produces another day of fun, play and engagement with wildlife native to the Southern Appalachian Mountains. Admission to the Center is $6 for adults ($8 for non-Asheville residents), $5 for seniors ($7 for non-Asheville residents), $4 for youth ages 3-15 and children age 2 and under are free, Members are free (join before you visit at www.wildwnc.org). As always, Hey Day presents live performances on the main stage including music by Ric Ledford and Reems Creek Incident, Rick Hubbard’s Kazoobie Kazoo Show, and The Asheville Clogging Company and the Mountain Thunder Cloggers. Festivities include delicious food and snacks and a variety of fun activities and exciting animal encounters with our furry and feathered ambassadors. From face painting to pumpkin painting to a hay jump, and lots to learn, there is fun around every corner at Hey Day! The Friends of the WNC Nature Center appreciate the support and generosity of this year’s sponsors: Creekside Taphouse, Earth Fare, Hulsing Hotels – Crowne Plaza and Four Points, The Laurel of Asheville, Lynch Graphics, R.E.A.C.H. of Asheville, Rita’s Italian Ice, Ultimate Ice Cream, and Celebrity’s Hot Dogs. For additional information visit www.wncnaturecenter.com or call 828-259-8080. The Friends provide support to the WNC Nature Center- Asheville’s Wildlife Park! Accredited by the Association of Zoos and Aquariums (AZA) the zoo features over 250 animals native to the Southern Appalachians including cougars, red wolves, otters, birds of prey, black bears, and reptiles. For more information on the Friends of the WNC Nature Center, or to join the Friends and support future projects, visit www.wildwnc.org . ASHEVILLE NC – A new platform will join the three performers’ stages at Western Carolina University’s Mountain Heritage Day, Saturday, Sept. 28, on the campus in Cullowhee – right in front of the Balsam Stage, created for audience members to share their dance skills while the bands play on. WCU’s free celebration of Appalachian culture also will feature a full schedule of mountain music, fun activities, about 100 booths of the region’s finest arts and crafts, and 28 vendors offering ethnic, heritage and festival food. The 39th Mountain Heritage Day will have attendees kicking up their heels between 10 a.m. and 5 p.m., preceded by the 5-K foot race at 8 a.m. Parking and festival admission are free. Balsam and Blue Ridge stages and the Circle Tent will offer continuous mountain music, clogging and storytelling. Musical performers will include Buncombe Turnpike, Whitewater Bluegrass Company, Sons of Ralph, the Queen Family, Jeff Little Trio, Wild Hog Band, Blind Pig Gang, Roan Mountain Hilltoppers, Mountain Faith and others. Some will accompany the Bailey Mountain Cloggers, Fines Creek Flatfooters and J Creek Cloggers. The Circle Tent will feature a banjo circle, sacred and spiritual music, ballads of crime and punishment and a discussion about Jackson County’s listings on the National Register of Historic Places. Sites such as the Jarrett House in Dillsboro, Judaculla Rock on Caney Fork and the Mordecai Zachary-Tolbert House in Cashiers will be discussed at 10 a.m. by Janice Blanton, Gerald Green, Jane Nardy, Tim Osment, Joe Rhinehart and others. Other areas will be active with demonstrations of Cherokee blowguns, stickball and the Cherokee courtship game “Fish,” Sacred Harp singing and an antique auto show. The Children’s Tent will provide entertaining activities for younger visitors throughout the day, and kids also will enjoy free wagon rides and hayrides. Mountain Heritage Day also offers a variety of demonstrations and contests centered on authentic mountain folk arts and skills: competitions for best beards and mustaches, period costumes, canned and baked goods, and chainsaw woodcutting. A stroll through other areas will feature 19th-century wood furniture carpentry, black powder shooting, blacksmithing, harnessing draft animals, weaving, natural color fabric dyeing, corn shuck crafts and broom-making. In addition, the Mountain Heritage Center’s exhibits of Appalachian culture and history will be open all day, and storyteller Gary Carden will spin tales of mythical beasts in three sessions at its auditorium. Rain or shine, the festival will bring history to life and fun to thousands. Though pets are not allowed on festival grounds, service animals are welcome. Festival attendees are encouraged to bring lawn chairs and/or blankets for comfortable seating; and hats and sunblock as needed. Shuttles will operate throughout the day, with stops at designated parking and attraction locations. Whether sitting, standing, riding, strolling or dancing, visitors will be able to pack a few centuries’ worth of learning and entertainment into a single day on Saturday, Sept. 28. For more information, go online to www.MountainHeritageDay.com or call 828-227-7129. ASHEVILLE NC – Farmer and Chef South is a collaboration between nationally published cookbook author, Debby Maugans and Christine Sykes Lowe, Asheville based owner of T3 Creative Group, marketing and PR collective with special focus on culinary and hospitality promotions. The duo will be hosting Joe Yonan, Food and Travel Editor of The Washington Post and author of “Eat Your Vegetables” for his Asheville debut and book signing/cooking demo. The event will be held October 6th at Dough on Merrimon Avenue, and will collaborate with chef and owner of Dough, Brian Ross, as well as Scott Paquin of Firefly Farms, who will be supplying local, seasonal produce used for the recipes. Partial proceeds of the event will be gifted to Go Kitchen Ready, a food-service training program that assists low-income individuals who face barriers to employment. Joe Yonan is the two-time James Beard Award-winning Food and Travel editor of The Washington Post and the author of “Eat Your Vegetables: Fresh Recipes for the Single Cook” (Ten Speed Press, August 6, 2013). As reviewed by Epicurious.com. “Yonan intersperses his recipes with personal essays; in the global reach of his flavors; in the confident voice that seems to say, Stick around, there’s a lot to learn here — whether you’re cooking for one, two, or a few; going it alone as a vegetarian among carnivores; or just starting out as a cook of any sort.” In 2011, he wrote “Serve Yourself: Nightly Adventures in Cooking for One,” which Serious Eats called “a truly thoughtful, useful, and incredibly delicious book.” Joe was a food writer and Travel section editor at The Boston Globe before moving to Washington in 2006 to edit the Post’s Food section, for which he also writes the Weeknight Vegetarian column and occasional feature stories. His work from the Globe and Post has appeared in three editions of the “Best Food Writing” anthology. “Christine and I are excited to bring Joe Yonan into Asheville to promote his new book. His philosophy of cooking and eating is like ours; that is, we eat by the rhythm of the farm. We endeavor to support farms and the educational efforts that feed our communities and enable people to eat well”, says Maugans. Farmer and Chef: Asheville will be the first Farmer and Chef South cookbook with recipes from chefs and farmers in our community, stories about how chefs cook at home, menus from beer, wine and food dinners, ordering information for local products, profiles of the personalities behind our food scene, and much more. Since October 2012, Farmer and Chef has been photographing parties, farms, food, and people and collecting recipes for the book. Maugans will be testing all the recipes to edit them into a style that makes them easily adaptable for the home kitchen. Farmer and Chef South is the first regional Farmer and Chef collaboration. Lowe and Maugans will bring the concept to other regions of the country that have passionate, active food, farm and sustainable cultures. ASHEVILLE NC – The Center for Holistic Medicine on Haywood Road in downtown West Asheville will be converting its front reception room into an aromatherapy and incense boutique this coming October. “After five years in business, we are aiming to expand our offerings and bring to the community rare and hand-selected products that you just can’t find anywhere else in town,” says acupuncturist and Center founder Nancy Hyton. “We also want to make these items available because we feel that they can extend the healing experience, giving people something to take with them that they can enjoy at home.” The Center will continue to provide holistic services, including acupuncture, herbal medicine, craniosacral therapy, and therapeutic massage, and plans to expand its offerings soon to include things like aromatherapy massage, hot stone massage, and lymphatic drainage. The boutique will feature natural Japanese incense from esteemed companies like Nippon Kodo (established 1575), Baieodo (est. 1657), and Shoyeido (est. 1705). These incenses are produced in traditional ways from secret family recipes, and are made from a dough of woods, herbs, and resins that is extruded like spaghetti. “It is a totally different experience from the incenses one commonly finds for sale in the US that use petroleum-based chemicals for fragrance and sodium nitrate to make them burn,” says Nancy. “Because these incenses are made from 100% plant material, they are very light and pleasant smelling and have the added benefit of the aromatherapy properties of the plants.” They are also lower in smoke because they do not have a bamboo core. Some of the many benefits of these natural incenses include a reduction in stress and anxiety, sharper focus for study and meditation, improved sleep, and air purification. “I have been using traditional Japanese incense and essential oils for decades and I really want to turn people onto the world of authentic aromatherapy,” says Nancy. “We are assaulted by synthetic aromas on a daily basis to such an extent that most of us don’t even remember what natural things smell like any more,” she says. The boutique will open on Tuesday, October 8th with an official opening reception on Thursday, October 26th at 7pm and special incense-sampling parties to be announced. The Center for Holistic Medicine is located in West Asheville at 779 Haywood Road in the Bledsoe Building between the Westville Pub and Orbit DVD. Their website is www.centerholistic.com and their phone number is (828) 505-3174. You are currently browsing the Asheville NC News blog archives for September, 2013.